FOREX TRADING GUIDE: HOW TO USE FIBONACCI RETRACEMENT TOOL FOR RANGE TRADING? 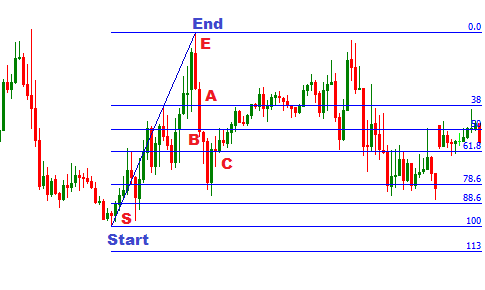 HOW TO USE FIBONACCI RETRACEMENT TOOL FOR RANGE TRADING? We already know, Fibonacci retracement tool can be used for both breakouts trading and range trading, but when I was first introduced with this great technical analysis tool, I only learned range trading with this Fibonacci tool .Actually, it is very hard for a trader to say that he/she is a range or breakouts trader specifically. Traders should learn both breakouts trading and range trading to increase the reliability of the trading strategy. This post is aimed to explain the techniques of using the Fibonacci retracement tool in range trading. We already know that the Fibonacci retracement tool draws the support and resistance levels on price chart, which are placed at the Fibonacci ratios. When a bullish trend is reversed after reaching the top, a Fibonacci retracement tool is drawn starting from a previous low to a recent higher high to find the support levels. On the other hand, when a bearish trend is reversed after reaching a bottom, a Fibonacci retracement tool is drawn starting from a previous high to a recent low to find the support and resistance levels. 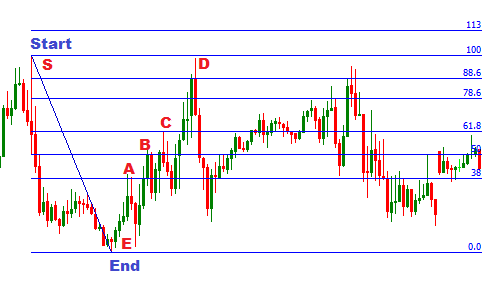 In the above image, a Fibonacci retracement tool is drawn starting from a high to a low. We can see the bearish trend is already reversed. Now with the Fibonacci retracement tool we find that 38%,50% and 61% are the first three resistance levels. When the price reaches the resistance levels, it retraced back and made a correction. So, a sell order is suggested when the price reaches to a strong resistance levels. In the above image, a Fibonacci retracement tool is drawn starting from a low to a high. The Fibonacci retracement levels represent the support levels. Here we can see that the 38%, 50% and 61% retracement levels are broken by the price at first attempt. So no buy signal for the range traders until the price reaches to 78.6% retracement level. Generally, when the price reaches to a support level, a buy signal is suggested for range traders. This is the basic techniques of range trading with Fibonacci retracement levels. The question that comes in mind is "Should a trader place an order every time price reaches a support or resistance levels?" The answer of this question is no because price can also break a Fibonacci retracement level. In the image at the top of the post, we can see the price pulled down when it reaches to 38%, 50% and 61% Fibonacci retracement levels. But when the price reaches the Fibonacci retracement levels second time it breaks the Fibonacci retracement levels an pushed up. The price was pulled back when it reaches to 100% retracement level. So a sell order is suggested for the range traders when the price reaches to 100% retracement level. In my next posts,I will write about the techniques of successful range trading with Fibonacci retracement tool. There have so many techniques of breakouts and range trading with Fibonacci retracement tool, with out them no trader can successfully apply the Fibonacci retracement tool in forex trading. In bottom line, if you have any question regarding the range trading with Fibonacci retracement tool, you can drop a comment below. You can enter your email address in the subscription box to receive the updates.